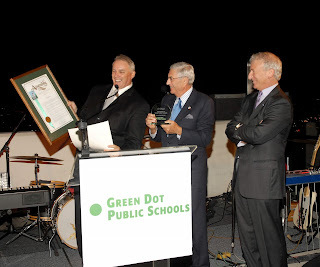 Steve Barr (left) and Eli Broad (center) in 2007 with $10 million for Green Dot, Inc. The program is set, the CTA's welcome mat is rolled out, and NPE is trying fill seats for Diane Ravitch's 4th NPE talkathon on October 14-15 in Oakland, CA. If you don’t have the $1000 to attend, you should check with your corporate NEA or AFT affiliates for available "scholarships." CTA is behind this year’s conference, and with their growing charter teacher membership in California, there should be plenty of cash on hand to fill the 500 seats for this withering cause. Looking at this year's NPE program presentations related to charter schools, there is clear evidence that NPE's policy schizophrenia has become even more pronounced and ingrained. We find there are scheduled presentations and discussions by those who promote charter schools, by those who would limit charter schools, and by those who vow to end charter schools. With so many clamoring and disparate voices to hear at once, it becomes harder and harder to discern a clear message from NPE/AFT/NEA other than, of course, the clarion call new AFT and NEA and NPE members. This year's NPE meet-up continues a self-contradictory effort to expand a shrinking coalition that, essentially, stands for nothing and will fall for anything. It is a dysfunctional group that is run by Clinton charter supporters, AFT and NEA chiefs, and fronted by Diane Ravitch and her bloggers at Basecamp. This motley crew can be counted on to advocate for and/or against charter schools, depending upon whose wallet that AFT/NEA/NPE is trying to pry open at the moment. When Ravitch's host, the California Teachers Association, joins Diane this week to talk about the evils of charter schools, the focus will be on the handful of for-profit charter schools in California. This year, however, it is harder than ever for the AFT/NEA/NPE to make a convincing case that their qualified opposition to “for-profit” charters carries any remaining weight at all, especially given the fact that California has just 34 of these “for-profit” charters for CTA to oppose. In California as elsewhere, for-profit charter schools make up a small percentage of the total number of the resource-draining corporate charter schools that are bleeding out public systems wherever they operate. In fact, California has over 1,200 of the “non-profit” charter schools for CTA to mine for members, and CTA has shown its support for these charter schools, as it eagerly tries to sign up more and more of these charter teachers. The "non-profit" charters are the ones that CTA, Ravitch, and their faux resistance movement continue to embrace. CTA has signed up almost a third of the 7,500 charter teachers in California, thanks to the promotion by NEA/AFT of Green Dot Schools, which is the creation of Eli Broad and his corporate school enforcer, Steve Barr. The same year that Eli Broad handed Barr $10 million for Green Dot, Barr said this about then-UFT President, Randi Weingarten: "Randi Weingarten is one of the most progressive labor leaders in the country." CTA knows charter school teachers, like traditional public school teachers, care deeply about their students and work hard to help them succeed. Many charter schools are locally driven, provide an excellent education and deserve our support. For example, Green Dot Public Schools California is a Los Angeles charter operator that strives to be open, equitable and inclusive. Despite CTA's exuberance, we know that Green Dot's charters are the same kind of selective, non-inclusive, segregated, and test-based public money sinks that threaten the continued financial viability of public schools in California and elsewhere. They are privately-managed without public oversight and without elected boards. Most importantly, they drain away billions of public dollars meant for education in order to create investment opportunities for Eli Broad's buddies. We know, too, from state data in California that Green Dot serves fewer African-American children, as well as fewer special needs and ELL students than the community public schools from which they draw students. And through slick marketing ploys and administrative winnowing tactics to get rid of problem students, Green Dot's populations do not represent the communities that must face Green Dot's insistent, corporate-funded hostile takeover attempts. And even though public systems like Inglewood Unified continue to resist Green Dot's hostile takeover (to no avail), CTA is willing to look the other way as long as they can sign up more members and collect more union dues from Green Dot's teachers. Where is CTA's support for the public systems that are trying to survive the corporate onslaught designed by the charter industry? The sickening Vichy-style collaboration between the charter industry and corporate puppets from AFT/NEA/NPE serves to further the Eli Broad plan that started over twenty years ago, when part of Broad's first $10 million education handout funded the creation of The Union Reform Network (TURN), which continues as a growing and deadly cancer inside both NEA and AFT. TURN was intended to make the corporate administrative agenda and the union agenda indistinguishable, and it was embraced by leaders of both AFT and NEA. Thanks to Diane Ravitch and the union bosses’ deal-making, Eli Broad is well on his way to realizing his goal that includes eventual destruction of the teaching profession and public schooling as we have known them for over a hundred years. A thorough repudiation of AFT and NEA corporate unionism and their deceptive promoters remains the only course of action to stop the corporate advance of privatization via charter school. For outfits like NPE, the pretense of pragmatic problem-solving has functioned as a thin cover for unprincipled maneuvering to fit the needs of corporate reformers into organizations that were created to oppose them. The result has been the ostracism and marginalization of those whose principled stances Ravitch has labeled as policy purism. What was, not so long ago, the beginning of a real resistance movement against corporate education reform, has been coopted by an aristocracy of the arrogant and cynical self-serving power brokers who continue to make the teachers and parents that they use and abuse complicit in their own subjugation. The unions participate in the demonization of veteran teachers. Interesting and explains some of the panel speakers. BTW, it is not $1,000 to attend. My ticket was something like $150. I'll comment back here after the conference. If you are flying in from out of town, expect to spend at least a thousand dollars.